> the normal big block step aspect. All evidence point to the core being stepped regardless of how large the blocks were which as far as we know it may well have been no different than the others. G2 has granite casing stones at its base and limestone at its top. He said "apparently" which is supposition based on the idea these would have been built largely after the main pyramid which it and its mortuary temple weren't finished. > intended to be finished as a true pyramids. Which began with stepped cores. > has NOT got a step core. > to how to finish G3a in quick time. K. But why spend the effort on this one compared to all the others including the main pyramid wasn't completed? But we don't know it doesn't have a stepped core with neat blocks and there is much reason to believe it does. I'm not sure what the point is in making this one pyramid unnecessarily different. If this were not in a ruined state we would be none the wiser it had a stepped core and would look no different than G1 or G2. > the same vain as G3b & G3c. I do not think this is what we are looking at. The pavement abuts the large blocks which continue to the right. Not to mention if you look at this corner you can see the blocks of this area are vertical which would mirror the step right behind it. 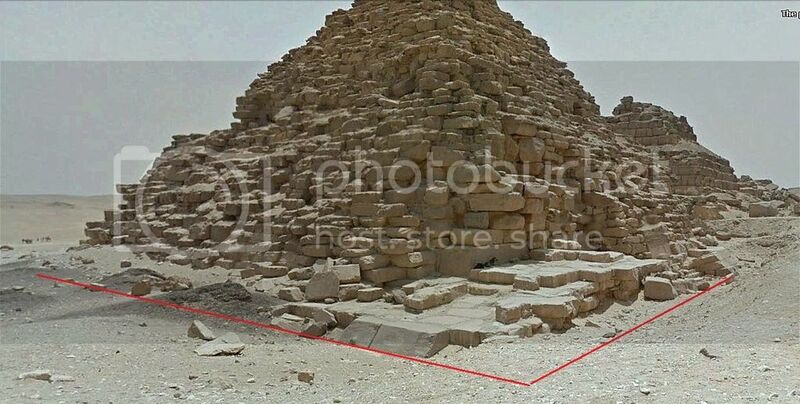 Its not just that this area is "exposed", its architecturally incongruent with the areas directly around it and the rest of the base of the pyramid. Obviously something happened to the completion of these 3 pyramids, but all things considered there is no reason to think they just so happened to build the one that was completed completely different than the other two that were unfinished. If their plan was to do a rush job, why start from scratch using a potentially untested method when you had two stepped cores right there waiting to be finished? > granite casing on G3a ? Not sure where you are getting that quote from which in context I assume he means as a whole and not entirely. 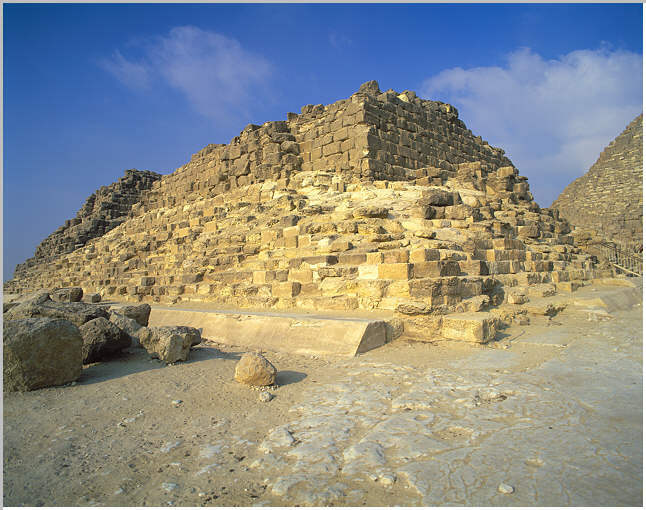 HERE he lists it as being cased and says: "The eastern pyramid (GIII-a) was completed as a true pyramid with granite and limestone casing blocks,..."
"The complex illustrates the sequence of construction at his death. Pyramid GIII-a (p2, lower Fig.) has a finished, cased, inclined exterior, but GIII-b and GIIIc have uncased, stepped exteriors." In this area they are clearly slanted which are flattened out at the top block. Slanting the casing is old school, but regardless, this does not match what is seen on the casing on the alcove pavement corner. This makes no sense if these two lines of casing stones were meant to be joined together. Something is off here. There are no foundations for a stepped casing [for G3-b and G3-c] and there is no evidence to indicate that a partially completed true pyramid once existed and was removed. If the stepped interior and the inclined exterior were raised together, we should find a base apron surrounding both GIII-b and GIII-c on which the inclined exterior was initially built. Both pyramids were excavated to their bases in the areas of their mortuary temples without finding the base apron. 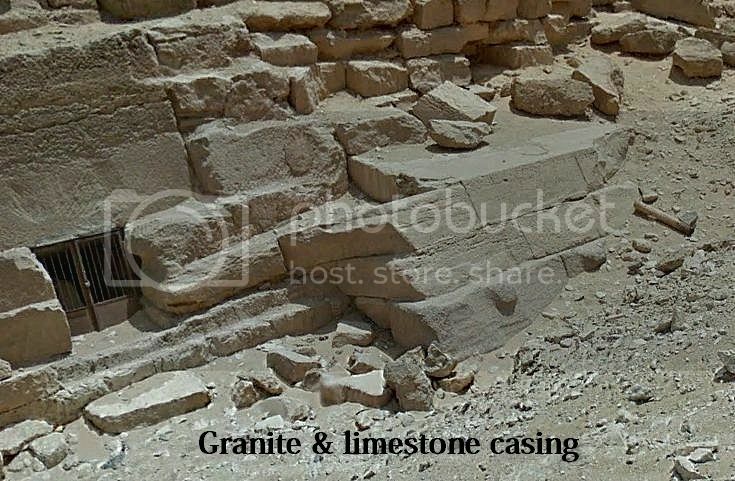 This evidence indicates that the stepped interior was an intermediate step to the final true pyramid and that the stepped interior was completed before the exterior true pyramid was started. Which for these anyways, makes it a little hard to start building with casing stones first. Edited 5 time(s). Last edit at 08-Mar-17 01:07 by Thanos5150.